The solution allows an employee to manage their project timesheets on a mobile device. An employee can create and submit a project timesheet. The solution also allows an employee to approve project timesheets if they have been designated as an authorized approver. The application surfaces the Dynamics 365 for Finance and Operations timesheet functionality that resides in the Project management and accounting area of the product on a mobile device. 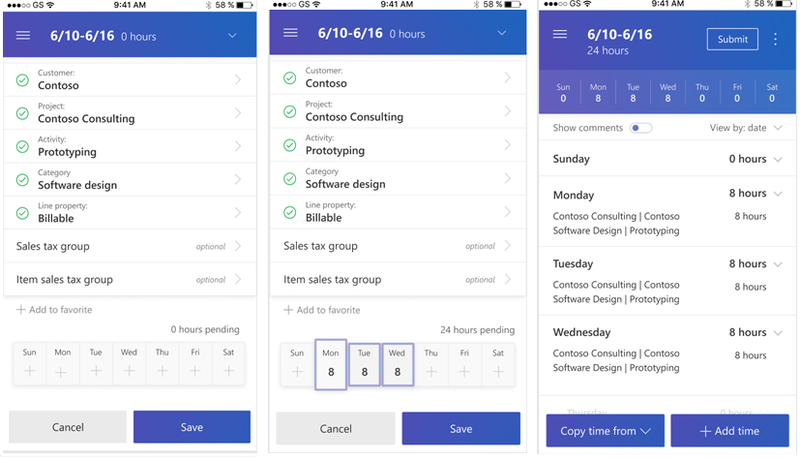 Speedy, accurate entry through use of copying from previous timesheets, copying from saved favorites, and copying from the employee’s assigned projects. Ability to copy time for a project from one day to the next, enabling efficiency and reducing mistakes. Employees can include internal comments, which would be used to communicate to the reviewer, or customer comments, which will be surfaced on the customer’s invoice. Lookups showing recently used and assigned project information speed data entry for the employee. Reviewers have the ability to approve, return or delegate the timesheets to another reviewer. Employee comments are readily visible to the approver, allowing for timely approval review.